I come from a long line of crafty women. My great grandmother was a hat maker. My grandma owned a dress making shop. My mom sewed both of my sisters’ wedding dresses, one with a broken wrist (and a hot pink cast). Either one of my sisters could sew, knit, and paint circles around Martha. I have a twinge of it but it could certainly be developed. Even though it is 22 degrees on this balmy Boston day I feel like Spring is around the corner. Every year at this time I get the sewing bug, with the intention of crafting my own Spring/Summer wardrobe of skirts and dresses from scratch. 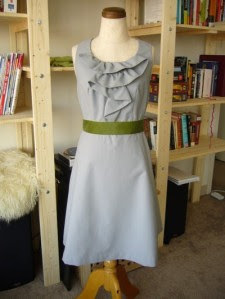 This year is no exception and my first slated project is the Burda Coffee Date Dress. This amazing free pattern is begging to be added to my wardrobe.